Fitness for Life, Sixth Edition: What Is Physical Fitness? This is an excerpt from Fitness for Life, Sixth Edition, by Charles Corbin and Guy Le Masurier. Physical fitness refers to the ability of your body systems to work together efficiently to allow you to be healthy and perform activities of daily living. Being efficient means doing daily activities with the least effort possible. A fit person is able to perform schoolwork, meet home responsibilities, and still have enough energy to enjoy sport and other leisure activities. A fit person can respond effectively to normal life situations, such as raking leaves at home, stocking shelves at a part-time job, and marching in the band at school. A fit person can also respond to emergency situations - for example, by running to get help or aiding a friend in distress. Physical fitness is made up of 11 parts - 6 of them health related and 5 skill related. 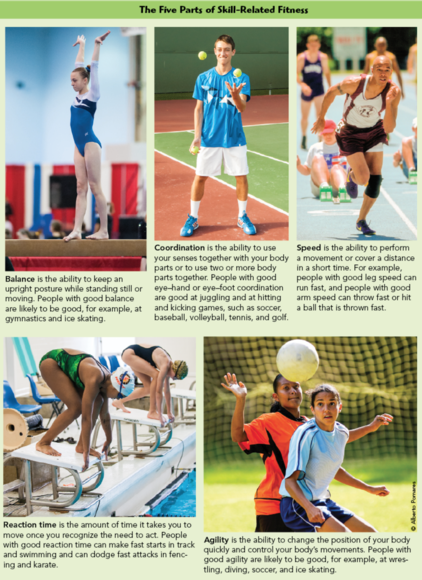 All of the parts are important to good performance in physical activity, including sports. But the 6 are referred to as contributing to health-related physical fitness because scientists in kinesiology have shown that they can reduce your risk of chronic disease and promote good health and wellness. These parts of fitness are body composition, cardiorespiratory endurance, flexibility, muscular endurance, power, and strength. They also help you function effectively in daily activities. As the name implies, skill-related physical fitness components help you perform well in sports and other activities that require motor skills. For example, speed helps you in sports such as track and field. These 5 parts of physical fitness are also linked to health but less so than the health-related components. For example, among older adults, balance, agility, and coordination are very important for preventing falls (a major health concern), and reaction time relates to risk for automobile accidents. Each part of physical fitness is described in more detail in the two following features: The Six Parts of Health-Related Fitness and The Five Parts of Skill-Related Fitness. Think about a runner. She can probably run a long distance without tiring; thus she has good fitness in at least one area of health-related physical fitness. But does she have good fitness in all six parts? Running is an excellent form of physical activity, but being a runner doesn’t guarantee fitness in all parts of health-related physical fitness. Like the runner, you may be more fit in some parts of fitness than in others. 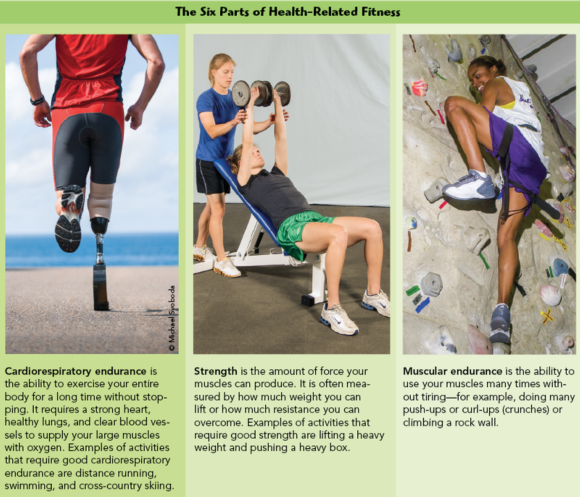 The feature named The Six Parts of Health-Related Fitness describes each part and shows an example. As you read about each part, ask yourself how fit you think you are in that area. 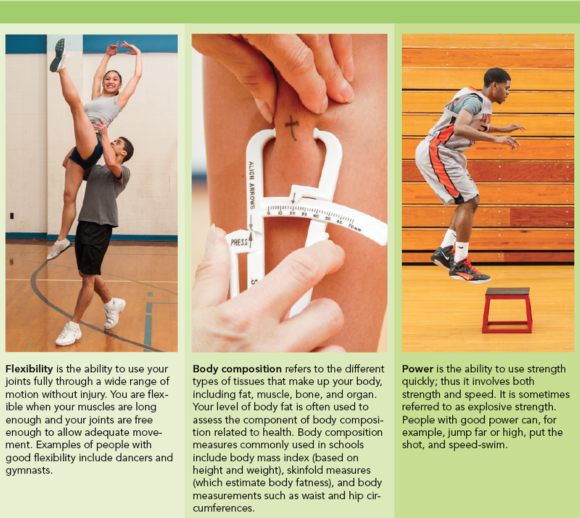 Power, formerly classified as a skill-related part of fitness, is now classified as a health-related part of fitness. A report by the independent Institute of Medicine provides evidence of the link between physical power and health. The report indicates that power is associated with wellness, higher quality of life, reduced risk of chronic disease and early death, and better bone health. Power, and activities that improve power, have also been found to be important for healthy bones in children and teens. How do you think you rate in each of the six health-related parts of fitness? To be healthy, you should be fit for each of the six parts. Totally fit people are less likely to develop a hypokinetic condition - a health problem caused partly by lack of physical activity - such as heart disease, high blood pressure, diabetes, osteoporosis, colon cancer, or a high body fat level. You’ll learn more about hypokinetic conditions in other chapters of this book. People who are physically fit also enjoy better wellness. They feel better, look better, and have more energy. You don’t have to be a great athlete in order to enjoy good health and wellness and be physically fit. Regular physical activity can improve anyone’s health-related physical fitness. Just as the runner in our example may not achieve a high rating in all parts of health-related physical fitness, she also may not rate the same in all parts of skill-related physical fitness. Though most sports require several parts of skill-related fitness, different sports can require different parts. For example, a skater might have good agility but lack good reaction time. Some people have more natural ability in some areas than in others. No matter how you score on the skill-related parts of physical fitness, you can enjoy some type of physical activity. Remember, too, that good health doesn’t come from being good in skill-related physical fitness. It comes from doing activities designed to improve your health-related physical fitness, and it can be enjoyed both by great athletes and by people who consider themselves poor athletes. As noted earlier, health-related fitness offers a double benefit. It not only helps you stay healthy but also helps you perform well in sport and other activities. For example, cardiorespiratory endurance helps you resist heart disease and helps you perform well in sports such as swimming and cross-country running. Similarly, strength helps you perform well in sports such as football and wrestling, muscular endurance is important in soccer and tennis, flexibility helps in sports such as gymnastics and diving, power helps in track activities such as the discus throw and the long jump, and having a healthy amount of body fat makes your body more efficient in many activities.